The Seated Liberty Half Dollar coin’s obverse features a full portrait of Lady Liberty seated on a stone, with a shield marked “Liberty” in her right hand and a pole with a liberty cap on the top in her left. The reverse depicts an eagle similar to that on earlier half dollars. 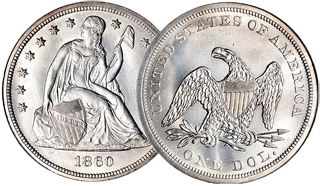 Seated Liberty half dollar coins were produced from 1839 to 1891 and went through several variations over this time period. The first change came late in 1839, when an extra piece of drapery was added to Lady Liberty’s left elbow; half dollars without this extra drapery are rare. In 1842, the coin changed again when the letters on its reverse were increased in size.